Savoring spicy Korean Kebab in cold winter is truly fun. Myeongdong is one of the busiest places in Seoul, South Korea. 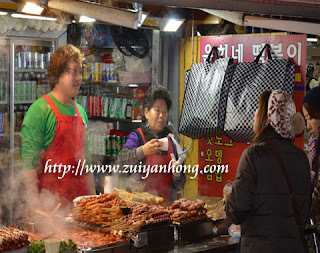 Tons of snack stalls are available in Myeongdong. 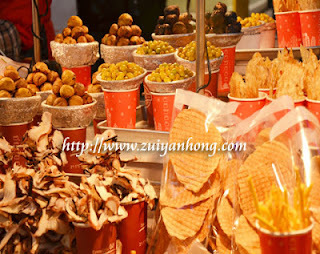 If you like spicy food, the spicy kebab of this stall surely suit with your taste. The winter temperature in Seoul is below 0ºC. 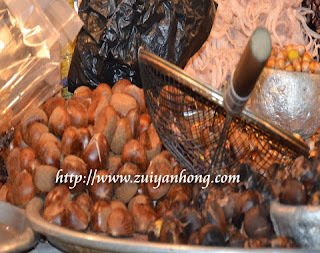 Eating warm chestnuts at chilly night under the colorful neon lights is a unique experience during my trip to South Korea. Passing by this snack stall, stop for a while to buy your favorite snacks. You can enjoy your snacks with Korean wine or hot drink at beverage stall. Pancake is sold everywhere in Seoul. Weary of traveling, buy few pancakes to fill your stomach. Pancake is delicious and not expensive.